Documentary telling the story of the pipers, who during WWI, climbed out of the trenches, unarmed, to play bagpipes for the Highland regiments going over the top and into battle. For four hundred years or more, Highland regiments advanced and attacked to the sound of the bagpipes. In the Great War, pipers climbed out of the trenches, unarmed, to face machine guns and shells. The descendants of those men return to the battlefields to discover individual stories of unparalleled bravery. A group of First World War veterans remember life in the trenches. The regimental piper has long been at the heart of the Scottish military. In the Great War, their role was beyond belief. 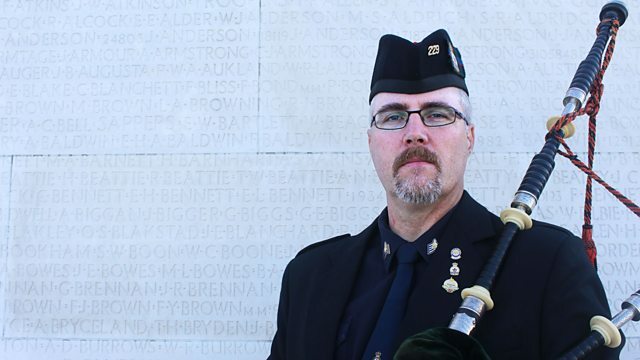 Kevin Laidlaw describes the legendary actions of his Great Grandfather, Piper Daniel Laidlaw, at the Battle of Loos. A spectacular drama recounts the experiences of young Glaswegians in the First World War. New perspectives on the war that changed everything. How did so many soldiers survive the trenches?